The Aran Islands are a group of three islands off the coast of Galway, Ireland. If you find yourself in Ireland, they are a must visit. The islands were first cultivated around 3000-4000 years ago by the Celts. The rocky islands were devoid of vegetation. By clearing the rocks and creating soil from layers of seaweed and sand the Celts created farmland. This method took about 300 years and has left the islands covered in the iconic small fields surrounded by stone walls. The sea climate allows the grass to remain green year round, although there are still few trees to be found. The Celts also build some impressive fortresses on the cliffs. Standing on the windy cliffs now, looking at the ruins, it is hard to imagine that anyone chose to live here. The largest of the islands, Inishmore, has around 800 inhabitants these days who make most of their living from tourism. In the summer the island is flooded by thousands of tourists, ready to climb the hills or explore by bike, bus and pony and trap. However, the best time to visit the Islands is in the fall or spring when there are fewer tourists and you get a real taste of island life. The weather is reasonable in October and November, but you are likely to be the only person at a given landmark, adding to the desolate and moody atmosphere. Aside from the nature and ruins, the only thing to do on the islands is drink. The four pubs provide food, shelter, beer, and entertainment. They function as a living room for the locals who go there to warm up with a hot whiskey and listen to live music. Even when most of the tourists have left, they are still dancing the night away. Like most islanders elsewhere, the citizens of the Aran Islands are warm and welcoming. They are happy to lend a hand, have a chat and share a pint. You will soon start to recognize the same people from the pub at the shops or on the street. Even though they have been hosts all summer, they are still happy to see you in the fall. But don’t go too late in the year: after working hard all summer, most of the sights and hotels close for the winter at the end of November, only to open again in March. 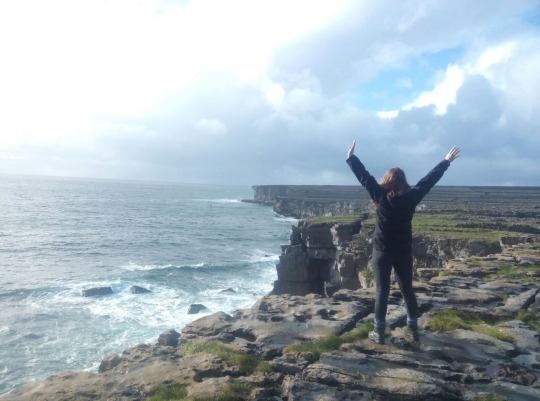 So, don’t miss out on experiencing both the roughness of the nature as well as the warmth of the local people on the Aran Islands. Hi! My name is Sophie and 2 years ago I quit my job to travel. Best decision of my life. Now I'm a digital nomad and I get to work while I travel the world. The best thing about traveling is all the beautiful things I get to see, the wonderful people I meet and the amazing delicious foods I get to try. I’ve learned a lot on all my adventures, so it only seemed right to share my insight, tips and recommendations with all of you. So whether you are a seasoned traveler or planning your first trip, let me help you out!